Ceratophrys cranwelli is one of eight species in the genus Ceratophrys; the South American Horned Frogs, so called because of their fleshy projections above the eyes that resemble horns. 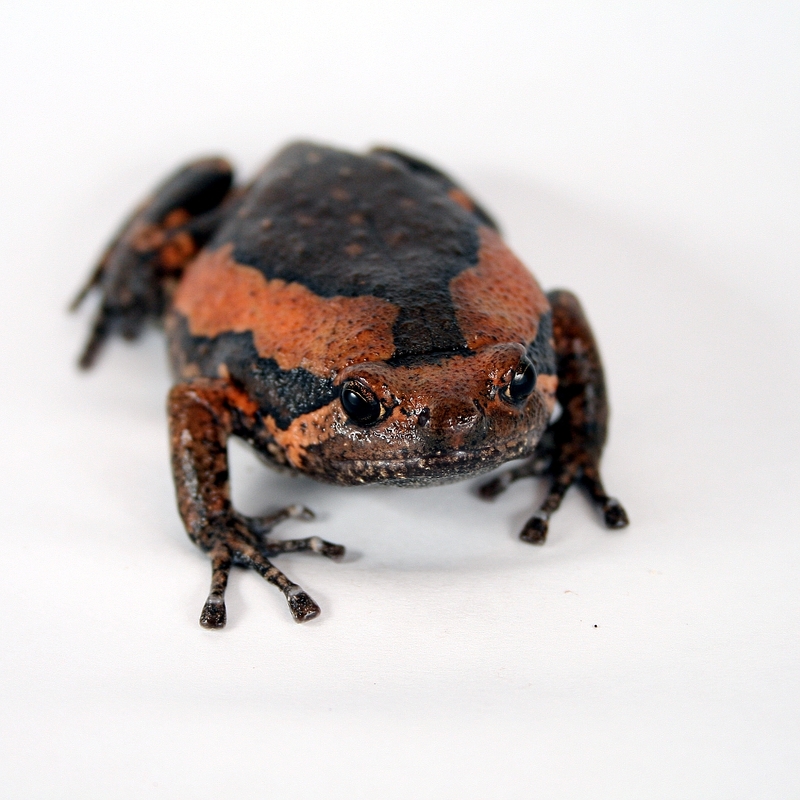 These ‘horns’ are more pronounced in species such as the Suriname Horned Frog (Ceratophrys cornuta) but less so in the Cranwell’s and there close relative the Ornate Horned Frog (Ceratophrys ornata). 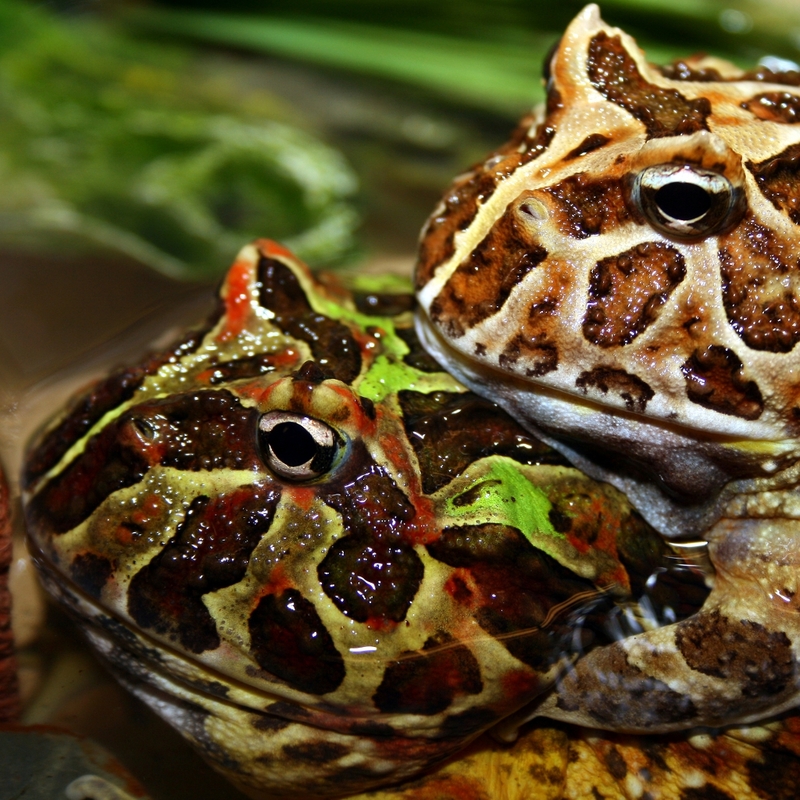 Their large round proportions and tendency to eat anything they can fit in their mouths, including each other, has also earned them the popular trade name of Pacman Frogs. The Cranwell’s Horned Frog is a large species; males normally averaging out at around 8cm and females slightly larger at around the 10cm mark. The typical coloration for the species is a light shade of brown marked with various other shades of brown, captive breeding has helped to create a variety of colour morphs including Green and various shades of Albino which are now as common if not more so than the original variety. Although these frogs are large they are not overly active and can be maintained in relatively small enclosures; in fact they often fare better in a smaller enclosure than when provided with a large amount of space especially when young. My normal recommendation for housing these frogs is an enclosure with a floor area of 8 to 10 times the size of the frog and this frog to floor space ratio can be maintained from froglet to adulthood. Glass tanks or deep plastic tubs are best for Horned Frogs, as you will need to provide a good depth (10-15cm) of damp substrate for them to burrow into. I personally have a preference for coco-based soils such as Eco-earth as they make it much easier to maintain the correct level of moisture than when using sedge peat or sphagnum moss, this is especially important when it comes to aestivation. A shallow water dish should be provided at all times but decoration in the enclosure can be kept to a minimum. Several pieces of cork bark may be arranged to form hides, live plants will be easily trampled or dug up by these frogs but silk plants can be used to add some aesthetic interest. Ceratophrys are a typical ambush predator they spend most of their time buried up to their eyes lay in weight for an unsuspecting insect, frog, lizard or rodent to pass by the burrow. It has been observed that these frogs will actively lure other frogs within striking distance by waving a hind limb in the air but I have yet to see this behaviour in captivity. The captive diet should consist largely of insects such as earthworms, locusts and crickets. An odd live-bearing fish or appropriately sized mouse can be used to provide some variety; these items should be fed infrequently but are very good for fattening up animals before and after aestivation. It has become something of a myth that these frogs can only be bred with the use of hormones but that just isn’t the case. Some breeders use hormones either as a matter of convenience or perhaps simply not knowing better but if things are done properly they are not needed. The most important aspect in breeding the Cranwell’s Horned Frog is the pre-conditioning cycle. In the wild they spend most of the year burrowed in a state of aestivation only emerging during the rainy season to feed and breed in the temporary pools formed by heavy rains, this cycle must be re-created in captivity in order for your frogs to breed successfully. Aestivation can be a big strain on frogs and so only animals known to be in good health should be subjected to the cycle. Although these frogs can reach sexual maturity before 12 months of age I would personally advise waiting until they are at least 18 months old before entering them into the breeding cycle. These extra few months of age will reduce the stress on the frog’s body and should also result in a larger amount of viable spawn. The cycle can be carried out at any time of the year but it is normally best to time the aestivation period to utilise the natural drop in temperature over winter. Prior to aestivation frogs should be fed heavily for 4 weeks and then feeding should be stopped completely and the frogs left for 2 weeks without food in order to empty their digestive system. The frogs metabolism slows during aestivation to such a rate that it won’t be able to digest food, if a frog is aestivated with a full gut the undigested food will decay in the stomach ultimately leading to the frogs death. 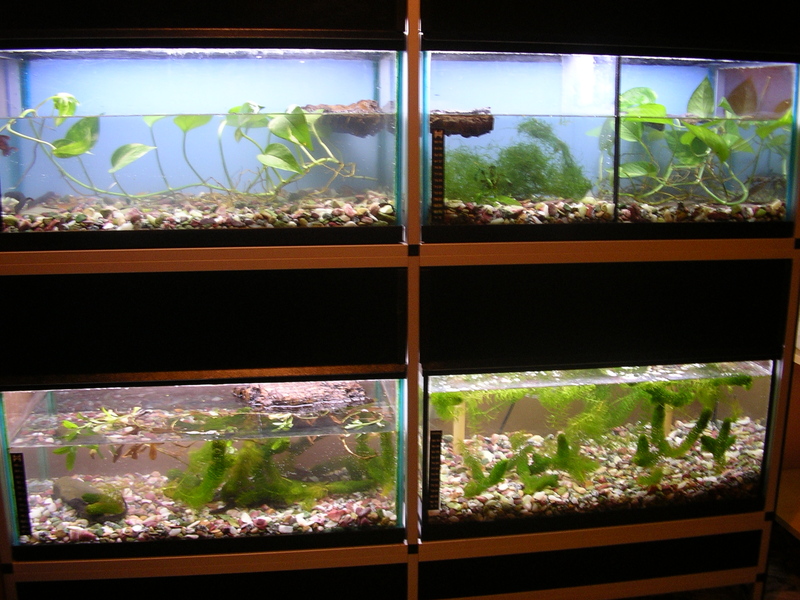 The frogs should now be ready to enter aestivation, fill a series of small glass tanks or well ventilated plastic containers with damp substrate to a depth of 8 inches, the substrate should be well moistened but dry enough that very little water can be squeezed out. Place the frogs in the individual containers each with a very shallow bowl of water and slowly cool them down to the low 20°C’s over a 2 week period. As the temperature drops the frogs should burrow to the bottom of the container and remain there asleep, if they do not do so then they should be moved back to normal maintenance and aestivation should be attempted again at a later date. After this initial 2 week cooling period the temperature can be gradually lowered further to around the 16°C mark and the substrate allowed to dry slightly, the aestivating frogs will cocoon themselves in layers of dry shed skin in order to preserve moisture. 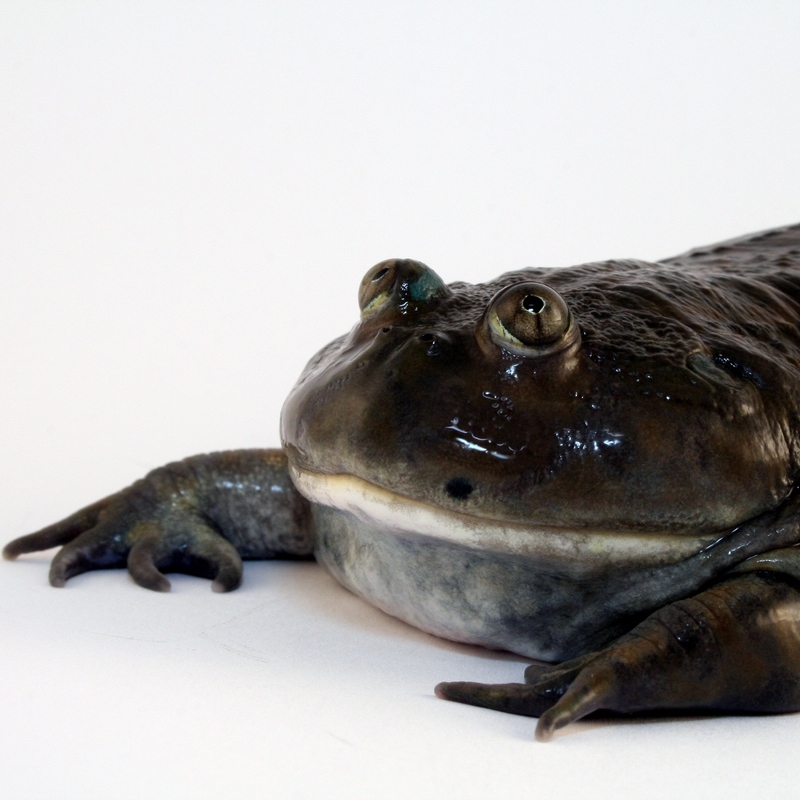 The aestivation period can last anywhere between 4 and 12 weeks, I would advise younger frogs be exposed to a shorter period than older larger frogs but the longer the aestivation the more chance you have of a successful breeding. When it’s time to wake the frogs gradually raise the temperature over a period of several weeks and re-moisten the substrate until normal humidity and temperature levels are reached. On emerging from aestivation the frogs will shed and urinate profusely so water will need changing at regular intervals throughout the day. It can take a week or so for the appetite to return, feed small amounts often at first and then feed heavily for 3-4 weeks. By this time males should be calling frequently at night, the frogs should now be ready to breed. Now comes the time to place the frogs together in a rain chamber. Place 2 males and a single female in the rain chamber and run the rain continually for 12 hours, by the time the rain stops the female should have a male clasped firmly to her back. The second male can now be removed from the rain chamber and the pair left to spawn alone. A large female can spawn several thousand eggs that hatch within 24 hours. As the fertile eggs develop and hatch the infertile eggs will break up and foul the water so infertile eggs should be removed as much as possible and the water changed at regular intervals to maintain water quality and stop the good eggs turning bad. Tadpoles will start feeding as soon as they are free swimming, for convenience and cost the main part of the tadpoles diet can consist of frozen bloodworm but they will consume a wide variety of foodstuffs including each other. These cannibalistic tendencies aren’t such a bad thing as it greatly reduces the number of tadpoles and resultant froglets that you will need to feed and house. The tadpoles require feeding continuously and as a result produce large amounts of waste so filtration is a must but even with good filtration water changes are an almost constant chore. The development rate of the tadpoles depends largely on temperature and food supply. Morphing can be achieved within 30 days at a body size of 20mm but at a slightly cooler temperature can be extended to a couple of months eventually morphing into 30mm froglets making their care a little bit easier. Froglets start feeding before the tail is fully absorbed and will accept a variety of invertebrates often showing a preference for the wriggling movements of worms and soft bodied grubs. Ceratophrys have a high metabolic rate and are prone to developmental problems, supplementing the diet with a good calcium and vitamin preparation on a regular basis is very important to prevent skeletal deformities. Housing froglets can be quite a challenge there are basically 2 options, communal or individual. Communal rearing of froglets can be done in a series of large enclosures but ensure that froglets are kept at a low stocking density and only froglets of similar size are housed together. Even then cannibalism can not be avoided and some will end up making a meal out of their siblings, often the froglets eyes are bigger than their stomachs and they can kill themselves by attempting to eat a froglet too large to manage. Individual housing of the froglets can result in fewer mortalities but is a lot more work each individual container requiring feeding and cleaning on a daily basis. 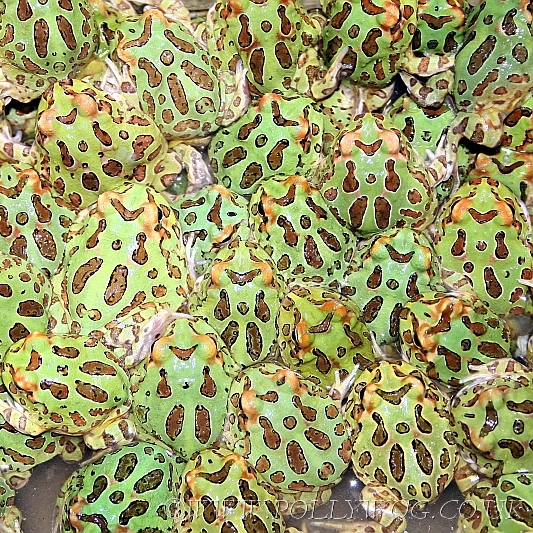 In all breeding and rearing Pacman Frogs can be a challenging experience consuming a lot of man-hours and requiring a lot of space. Although the results can be quite rewarding the commitment required in rearing tadpoles and froglets is such that I wouldn’t advise it be attempted by the average hobbyist with a full-time job.